No, no egg on it please. Yes, the trend in this country now is to put a fried on egg on many dishes for richness and protein. Blah. You can do the same thing with tofu believe it or not does the very same thing. Now mushrooms on the other hand, well, that is a bonus. Yes, please. I want lots of mushrooms. Koreans love their mushrooms. There are many varieties of mushrooms in Korea. They are used in multiple ways in Korean cooking. Which brings me to the King Trumpet mushroom or King Oyster mushroom. I do all my shopping for Korean ingredients at my local Korean market WooSung Oriental Food Mart. I love that store. The people who own and run that store are amazing. The music playing throughout the store is great as well; it’s not that Muzak stuff that you hear in some stores. Now back to the mushrooms. The mushrooms I bought were organic, fresh tasting and from an excellent grower of speciality mushrooms. I have this thing for kimchi fried rice. It’s so good anything, yet late at night when you need a quick pick-me-up, it’s THE thing to get you through until the next day. However, I chose to make it for dinner and pair it with King Trumpet or King Oyster mushrooms. King Trumpet or King Oyster mushrooms have a meaty texture and supposed to be quite firm. They also pair well with butter. So in our – VEGANS case, vegan margarine. Sauté up the mushrooms in vegan margarine or even a little coconut oil. Put them over rice and you have the makings of a great meal. I decided to make kimchi fried rice. Except the rice isn’t fried. Heat skillet to medium-high. Add 1 teaspoon sesame oil. Add King Trumpet or King Oyster mushrooms. Sauté mushrooms until lightly brown. Remove from skillet. Set aside. Add onions. Sauté until slightly brown. Add a 1/2 teaspoon spoon water at a time to water sauté if needed. Add kimchi and cook until hot. Heat rice in microwave. Add to bowl along with remaining teaspoon of sesame oil and kimchi juice. Place kimchi no-fried rice into a bowl. Top with King Trumpet or King Oyster mushrooms and greens. Yes, I have an entire plate of protein here yet it’s filling, satisfying, and simply delicious. Now you can also make this Korean by adding a bowl a rice, a bowl of soup, more vegetables, sauces, and kimchi; then you have a really satisfying and exciting meal. If using dried beans, sort through beans to eliminate stones and sticks. Rinse. Place beans in a pot and cover with at least 2 inches of water or 5 or 6 cups of water, 1/4 cup celery, 1/2 cup onions, 1 teaspoon garlic, and one bay leaf. Boil for at least 10 minutes, then lower heat and simmer for 1 1/2 or until tender. If using canned, drain and rinse beans in a colander. Sauté 1/4 cup celery, 1/2 cup onions and 1 bay leaf in a pot until translucent. Add 2 cups of water or vegetable broth (if desired) and 1 teaspoon minced garlic. Bring to a gentle boil for 10 minutes, then lower heat and simmer for 30 minutes. Rinse and take leaves off stem. You can dice the stem and sauté if you like. Sauté 1/4 cup celery, 1/4 cup onion, and kale. Add garlic and 1 cups water or vegetable broth (if desired). Cook on medium for 20 minutes. Take stems and gills off portobello mushrooms. Chop one of the three mushrooms,. Set aside. Add a teaspoon of olive oil or 1 tablespoon of water in with the portobello mushrooms in a skillet (to water sauté) until brown. Add remaining onions, and garlic to skillet with 1 tablespoon water scrapping all the bits in the skillet until onions are translucent. Add balsamic. Cook an additional 10 minutes. Add a portobello mushroom cap. Shopping Local is Always Wise and Right! I have wanted to join a food co-op for years now. Every year I have attended the Central Florida Veg Fest and the Central Florida Earth Day always stopping by the Homegrown Local Food Cooperative booth. The information is plentiful yet I wouldn’t sign up. Now the bulk of my grocery shopping is done at WooSung Oriental Food Market in Orlando, FL and Whole Foods. There are a multitude of products for vegans that I am not able to get if I were to go to the typical grocery store. Like really great quality produce, made by companies that have been dedicated to great tasting local products as well. As much as I love Whole Foods, I wanted to be able to try my hand at eating mostly produce while also eating more local fare. So I made the decision to start supporting my local co-op. I wasn’t sure what to expect since I hadn’t participated in a co-op before. I didn’t know what items would be available or what kind of treatment I would receive. Yet, for me, I wanted to support local farmers and food producers. So, off to the co-op we went. Once inside the building, I explored every area choosing from a wonderful selection of green veggies, root veggies, herbs, spices, mushrooms, and more. I only spent a little over thirty dollars and yet I got plenty of items to use all week without worrying about whether or not would I run out before my next grocery shopping trip. I ordered a medium size box of vegetables that are put together as a package deal for $30. In the box was radish, lettuce, celery, tomatoes, navel oranges, grapefruit, bell peppers and more. I also purchased a yellow onion and portabella mushrooms. What a great deal from the co-op. If you are in Orlando, FL, make sure you take another look at or a new look at The Homegrown Local Food Cooperative. you will not be sorry. This is the dish that I call my signature dish only because a great picture was captured due to how well it turned out and the flavor was AMAZING! So, I went about the business of preparing this dish for the simple reason that I was craving it and I wanted to celebrate the creation of my mini business cards with this image on the back. Why cards you say? It is my intention to reach as many people who are open and willing to be open to learning about the vegan lifestyle. what it can do for you, and how you can comfortably live it. Now, I am not about forcing anything on anyone. I am here to do my part as other vegans are doing to educate those seeking help in learning and living the vegan lifestyle. That is what I desired to do last year and for some time now. Yet, I am terrible at selling myself. That’s what happens when an artist has to sell oneself. I am great at motivating, inspiring, and empowering everyone else, just terrible at being that same champion for myself. When I’m near food, great food and ingredients. I can easily throw a dish together just by starting the prep process and before I know it, a dish is created. I’m intuitive in that way of how I prepare dishes. Which brings me to this dish again. 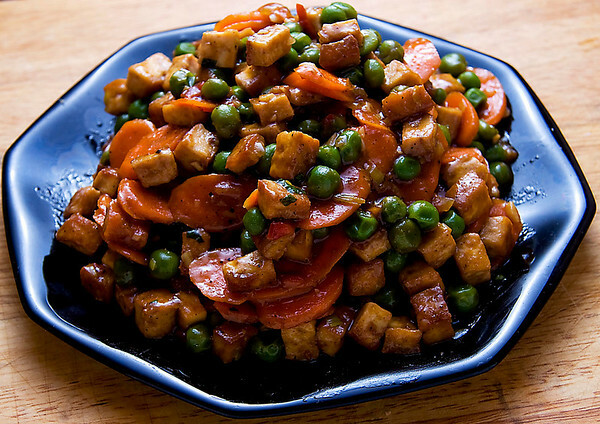 This recipe has onion, carrots, green peas, garlic and ginger, to name a few. As well as cranberry sauce or puree, tofu, and tamari. Once you get all the prep done, this dish goes really fast. Drain, rinse, squeeze gently and cube. Place tofu cubes on a slightly oil baking sheet. Bake at 450°F for 20 mins. Heat skillet, wok, cast iron regular or enameled skillet to medium high. Add 1 Tbsp vegetable broth. Add more vegetable broth as needed to prevent sticking. Add onions and ginger. Stir fry for 3 min. Add carrots, bell peppers, frozen green peas, and garlic. Set aside 2 Tbsp green onions. Add remainder of green onions. Stir Fry for 3 more mins. Add cranberry sauce and tamari, along with black pepper. Cook 1 min. Serve with rice or noodles of choice. There are times when I either I am short on time or I really do not feel like cooking. Let’s face it, most of us want convenience and great taste! So, with that in mind, we arrived home after having been out all day. I was too tired to commence to the laborious job of prep before getting to actual cooking. The freezer had edamame and frozen shiitake mushrooms, while the refrigerator had the Cajun (and Korean) basics of celery, onions, and bell peppers. Along with the Japanese daikon radish and in the pantry came nori to round it all out. I grabbed some Nishiki rice and got it started. Dinner was only about 20 minutes – the time it takes to cook the rice. Cook rice according to which type of rice you decide to use. Water saute celery, onions, and bell peppers until onions are translucent. Add shiitake mushrooms, edamame, daikon radish and cayenne, black pepper, garlic, oregano, thyme, and onion powder. Cook until mushrooms brown slightly. Add miso. Cook for only a few minutes at a simmer. Place rice in a individual serving bowl. Top with a cup of the gumbo. Top with shredded nori. So Fresh, Clean, and Exciting!!! Let’s here it for salad. Yes, a good ‘ole typical green salad with a twist. I love salad. It’s one of those meals where you can pull together any kind of vegetable and create a meal whether it be for lunch or dinner. I also love Korean food. As a vegan, a lot traditional Korean meals aren’t vegan, although some of their vegetable sides (banchan) are vegan. Plus when you go to a really good Korean restaurant that search banchan before your main dish comes, you can try a little of everything and they will refill the banchan. It’s that cool?! I created this recipes when I decided that I wanted a salad for a quick meal. When I opened the refrigerator door, my kimchi stared back at me and the creation of this dish was born. Have fun. Be creative. Wash, dry and chop romaine lettuce. Place into bowl. Wash, dry and julienne tomatoes. Place into bowl. Wash dry and julienne cucumbers. Place into bowl. Wash, dry and shred 3 green onions. Place into bowl. Drizzle kimchi juice over salad. Measure about 1 cup kimchi and chop into bite size pieces. Place over salad. Thinly slice one green onion. Sprinkle over top. Say it with me, zucchini! Lasagne! Admit it, those two words in the same sentence sends you into a serious full on drool. Can you see it? Imagine if you will the garlic basil sauce ladled on tofu ricotta and veggies or mushrooms between tender pasta sheets.What happens when you open the refrigerator door to find that you don’t have most of those ingredients? You switch gears and get creative. Here’s where ta da!! Zucchini comes in. Zucchini makes a great substitute for pasta when you’re trying to cut back and/or eliminate wheat from your diet. This dish came together because I hadn’t gone shopping and this was all I had in the house at the time. Serve it with a a salad of your choosing and it makes for a light meal. Add kale, half the onion and garlic to med high heat skillet and saute with vegetable broth about 5 mins. Set aside. Place drained beans into food processor or high speed blender. Puree until smooth. Salt and pepper to taste. Cut ends off zucchini. Slice thinly with a knife or a mandolin. Saute the rest of the onion until translucent. Add garlic and tomato sauce. Salt and pepper to taste. Cook for 10 minutes. Place three slices overlapping on a plate. Spread desired amount of bean puree over zucchini slices. Sprinkle desired amount of kale over bean puree. Spoon on desired amount of sauce over kale. Top with three overlapping slices of zucchini in a different direction (if desired). Repeat layering three more times. If you like, you can add fresh basil to the sauce or chiffonade and sprinkle over top as a garnish. Once you get the hang of this recipe, you’ll be making it quickly and often for you and your family.